Seymour Hall's second floor is home to as many as 31 first-year Knox College men. It smells terrible up there. Their RA encourages them to be reckless. In previous school years, the floor was called "The Deuce", and prior to that, "The Ghetto". There may be some dispute over this claim, as Seymour 3B is also referred to as the Ghetto. As of October 2017, the residents of Seymour 2 are making an effort to bring back "The Deuce". Seymour 2 is a "men only" dorm. It also tends to be a source of destruction and mayhem from year to year. Though a strong causal relationship can't really be shown, there is definitely a correlation. Residents of Seymour 2 are also heavily recruited by campus fraternities. The Suite offers traditional dormitory living and lacks a common area. The walls of the suite are occasionally used as a makeshift urinal by its residents. Seymour 2's bathroom is located at the midpoint of the hallway, to the left of the main entrance. The bathroom lacks urinals, instead the far right stall is labelled "The Pisser". The toilet to the left of "The Pisser" flushes so violently that it ejects water out of the toilet bowl. In the first few months of the 2017-18 year "The Pisser" was vandalized by an excessive amount of vomit. The vomit was left on the floor of the bathroom for several days before it was mopped up. The 2006-07 men of Seymour 2 and friends are notorious for their antics. A significant percentage of these men are expected to live together in Conger-Neal in 2007-08. The 2017-18 residents of Seymour 2 have embraced the suite's reputation for mayhem, anarchy, and general tomfoolery. 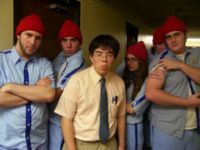 The Life Aquatic is a great movie, directed by a great director: Wes Anderson. The men of Seymour 2 and friends replicated the cast of this movie in great detail for Halloween. Then they all got drunk! Although those who recognized the costumes were low in number, their reaction was ecstatic. Many thought they were Devo. D-E-V-O. Did you know that you can order shipping boxes from the United States Postal Sevice for free? Did you know that you can order as many as you want, say... well over 500 of them? During Winter Term of 2007, that's just what the men of Seymour 2 did. They constucted bookcases, many short-lived weapons, a robot (see below), and a box fort. 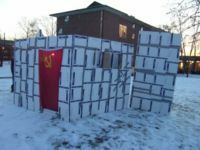 Led by Lyall Wallerstedt, the box fort was built in sections during the week, and on a Friday early in the term was hauled out to the Post Lawn at dusk, where it was fitted together and given a Communist flag for a door. The men of Seymour 2 are not Godless Commies (for the most part), they just happened to have a Communist Flag. Almost everyone in attendance had toy guns, which were used to harrass bypassers, and also to conduct raids on the C-Store for delicious hot chocolate. It was cold outside. Eventually, the fort was moved wholesale to outside the Caf, where it would be fully visible to people in the Gizmo. This was because having a bivouac full of scary Seymour men outside of Post kept all the girls hiding inside, and the fort was failing to garner enough attention. It also didn't help that people who did notice were treated as foreign invaders. 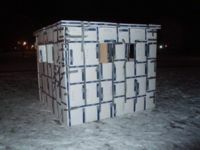 Eventually, it got way way to cold to keep hanging out in a structure made of cardboard and duct tape. The fort was abandoned to the masses of Knox College on a Friday night, with the sad realization it would probably be destroyed. As late as midnight, however, the structure was still standing, and had even been decorated by unknown persons with old Halloween decorations and drawings of naked people. But within the next hour it was gone. Seymour 3 followed up on the threatening messages they wrote on the walls of the fort, and knocked it over. This was the start of beef. Ugly beef. Being the upstanding men they are, Seymour 2 residents cleaned up the scattered wreckage and disposed of it properly. Don't worry, there'll be more of these things next year. And they'll be bigger. For the full article see Seymour Defender. Alternativley, see drink. The Seymour Defender is a robot that defends the residents of Seymour 2 in Seymour Hall. Contrary to popular belief, he is not named after Seymour Hall, but instead after Lyman K. Seymour, the alumnus for which Seymour Union is also named. Seymour Defender was constructed in the winter term of the 2006-07 school year by the residents of Seymour 2. His original design was to function as a defense robot for all of Seymour Hall. Seymour Defender is deceased as of 25 May 2007. Millions of years ago, back when Seymour 2 was called the Deuce, the residents formed a dodgeball team known as Deuces Wild. 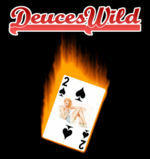 In the 2007 Winter Term, the men of Seymour 2 also formed an intermural dodgeball team called Deuces Wild, because they couldn't come up with anything better on their own. The members consisted of anyone who was around when it was time for a game. They lost nearly every single match... except maybe one, by sheer luck. Still, they had a cool logo, which was going to go on a t-shirt. Unfortunatley, the men of Seymour 2 are lazy, and it never happened. It's still a cool image though. On Good Friday of 2007, noted rabblerousers organized a Good Friday party, in order to commemerate the crucifixion and death of Jesus Christ. Photocopies from biblical coloring books were posted in the halls. Events such as Pin the Nail on the Crucifix and Bible Races, where pocket bibles were raced along suspended string, were held. Blood was transubstantiated into other fluids inside a chalice. The event was widely considered a success, as was the next night, when Lent ended, and a substantial amount of Seymour residents were allowed to indulge in substances again for the first time in 40 days and 40 nights. The Good Friday party is likely to become an annual event. As if water-ballooning Friars in the morning wasn't enough, on Flunk Day, the men of Seymour 2 & Friends participated in a sober paint fight on the lawn outside Post. Organized by Paige Barnum, it was, for many participants, the highlight of the day. Upon seeing the paint-splattered faces and clothes of the participants, many asked if it was an school organized event they missed out on. Actually, it is an event, the "Carnival of Colors". But apparently that was just for Friars, which is a shame because a lot of people would have liked to throw paint around recklessly instead of huff oxygen. (Wink wink, nudge nudge, Union Board). The paint fight was not without casualties, however. Some participants did not have protective eyewear, and got paint bombs right to the face. For one student, this was the third time that day his eyes were full of nasty crap, the first time being in the Mud Pit, and the second time in the Foam Pit. Flunk Day was harsh on his eyes, goddamnit. 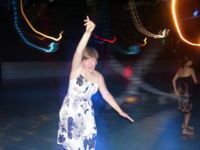 In the latter half of Sping Term, the men of Seymour 2 spent their suite money to rent out a roller-rink in Galesburg and threw a formal. Dissapointingly low attendence had the upshot that those present were able to dominate the floor, or at least wipe out more effectivley. Roller-skating is much, much harder than roller-blading. The DJs played a constant stream of disco and 80s one hit wonders. The whole thing felt like the season finale of a teen drama. Thanks go to Bryan Lund, the RA, for organizing the event. This page was last modified on 19 October 2017, at 22:53. This page has been accessed 25,415 times.